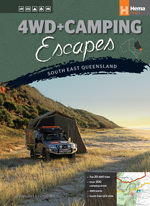 4WD + Camping Escapes - South East Queensland was already a printed book when Hema Maps approached us to convert it into an ebook. While consulting with them we decided that this book would look best as a fixed layout. The book has a massive number of images and tables, footnotes, and map cross-references that had to carry through successfully to the ebook. When the book was converted we then assisted Hema Maps to distribute the ebook on their website www.hemamaps.com.au.